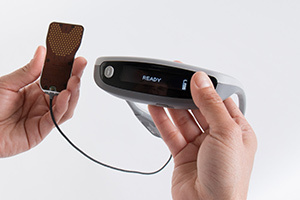 Helius Medical Technologies announced results of a pilot study, demonstrating the benefits of PoNS Therapy — a combination of the investigational Portable Neuromodulation Stimulator (PoNS) device with physical therapy — in patients with advanced MS. Specifically, the treatment was seen to improve both patients’ quality of life, and physical and cognitive abilities. The study, “Can Exercise Combined with Cranial Nerve Non-Invasive Neuromodulation (CN-NINM) Improve Mobility in Non-Ambulatory People with MS? a Case Study Series” was developed by researchers at the Tactile Communication and Neurorehabilitation Laboratory (TCNL) at the University of Wisconsin, and presented at the recent Consortium of Multiple Sclerosis Centers (CMSC) 2016 Annual Meeting in National Harbor, Maryland. Neuromodulation is believed to enhance neuroplasticity, the brain’s ability to restructure in response to new experiences, and the core mechanism underlying all cerebral learning and rehabilitation. The non-invasive PoNS device was designed to deliver neurostimulation through the tongue, and has been shown to induce cranial nerve neuromodulation when combined with tailored physical, cognitive or occupational therapy programs, suggesting it could be of use in a variety of neurological diseases. Researchers assessed the efficacy of PoNS Therapy in six people with advanced MS, with Expanded Disability Status Scale (EDSS) scores of 6.5 to 7.5 (EDSS score range is 0–10). Patients enrolled in the six-month study used the PoNS device combined with physical therapy targeting balance, postural stability, and walking movement or gait. Improvements were recorded in a number of parameters measuring quality of life, as well as physical and cognitive abilities. Real-life benefits were also observed. These included the ability to again use a walker for local trips, decreased fatigue, overcoming physical obstacles at home, increased independence with day-to-day activities, and greater community access. “Those with greater functional ability at the beginning of the study (EDSS 6.5-7.0) made the most significant gains but all subjects could be qualified as improved. The intervention shows promise to prolong functional ambulation and independence with daily activity,” said Mitch Tyler, the study’s principal investigator, in a press release. In a previous MS study sponsored by Helius, the PoNS device was shown to promote neural plasticity and balance after a 14-week treatment period. However, the average EDSS score for these patients was 4.5, not the 7.0 of this newer study, indicating a higher level of disability. “The patients in this study represent a much more challenging cohort and received PoNSTM Therapy for a longer period (6-months vs. 14-weeks), yet compliance remained high. The outcome is very encouraging,” said Phillippe Deschamps, Helius’ CEO.